Stream temperature is an important water quality attribute in many of California’s streams, especially those that support cold-water fisheries such as trout, steelhead, and salmon. Several fish have been identified as threatened or endangered, and elevation of summer stream temperatures is often cited as a cause. 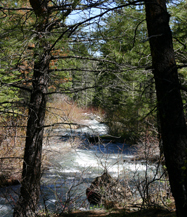 Activities such as streamflow diversion for irrigation of pastures, return of warm irrigation runoff to streams, and reduction in riparian canopy cover due to logging and grazing can increase stream temperatures. We are actively investigating the factors which control stream temperature and how management may, or may not, influence these factors on rangeland watersheds. The objective of this project was to provide guidance and explicit examples of how to graphically and statistically analyze and interpret watershed scale stream temperature data. 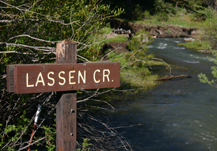 We utilize a comprehensive dataset of stream temperature, air temperature, streamflow, streamside vegetative canopy, and solar input collected during the summers of 1999-2001 across the Lassen and Willow Creek watersheds in northeastern CA. 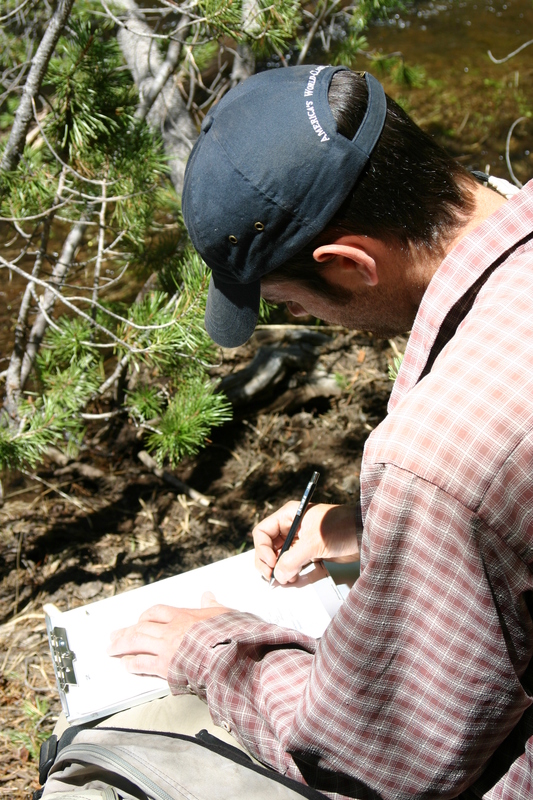 3) examination of watershed specific associations between stream temperature and factors such as air temperature, streamflow, and riparian canopy cover. In the first paper from this project, we have demonstrated some display and graphical analysis approaches by which data collected in typical stream temperature monitoring projects can be interpreted by and presented to land managers, watershed groups, and other interested parties. Native trout species, such as the redband trout, occupy thermally harsh stream habitats in hot, arid rangeland basins of the western United States. Declines in the distribution and abundance of these species has generated interest in understanding how these cold water species survive in these systems, as well as in identifying opportunities to restore these species to their former ranges. The purpose of this study was to assess the potential for thermal stratification to provide thermal refuge for redband trout in stream pools characterized by warm intermittent flow conditions on arid rangelands. We studied vertical thermal stratification in two pools during three summers on Boles Creek located on the Modoc Plateau in extreme northeastern California. 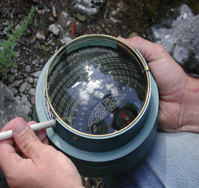 Water and air temperature data were collected on a 0.5 hour time step from 15-Jun through 15-Sep during 1996, 1997, and 2000 using commercial temperature data-loggers. Water temperature was measured at the top (0.3 m below pool surface) and bottom (0.3 m above pool substrates) of each pool. 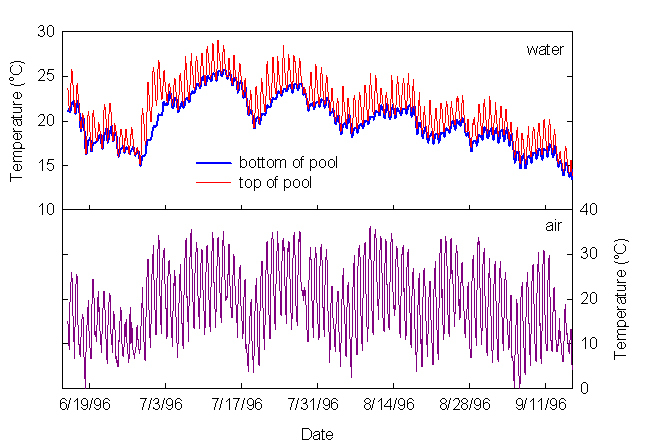 Vertical thermal stratification occurred within these pools creating conditions as much as 7.6 oC cooler and consistently more constant at the bottom of pools compared to pool surface waters (Figure 1). Thermal stratification was dependent upon air temperature with the magnitude of stratification increasing as air temperature increased. 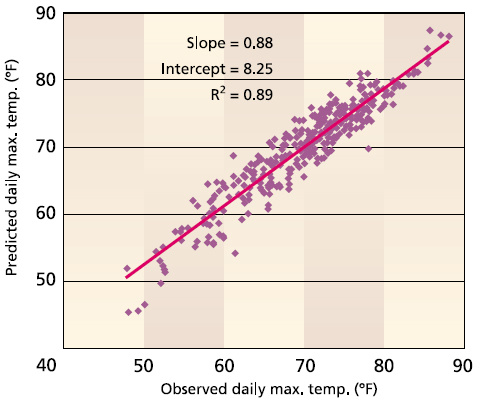 The magnitude of thermal stratification varied significantly from year to year, likely reflecting variation in annual weather conditions (Figure 2). Elevated water temperature can be a problem for sensitive species in many coastal river systems in northern California. 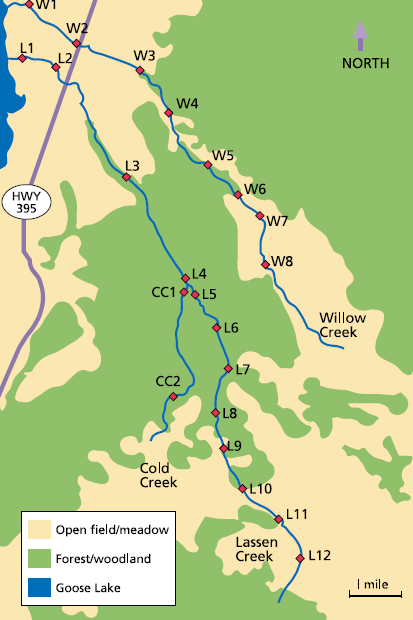 Coho salmon (Oncorhynchus kisutch) and steelhead trout (O. mykiss) are specific salmonid species of concern, and agencies have established target temperatures for many river systems in the region. These targets are based upon expectations of water temperature reduction by increased tree canopy cover above and near stream. Habitat restoration and species recovery strategies are being implemented to increase riparian tree canopy cover. 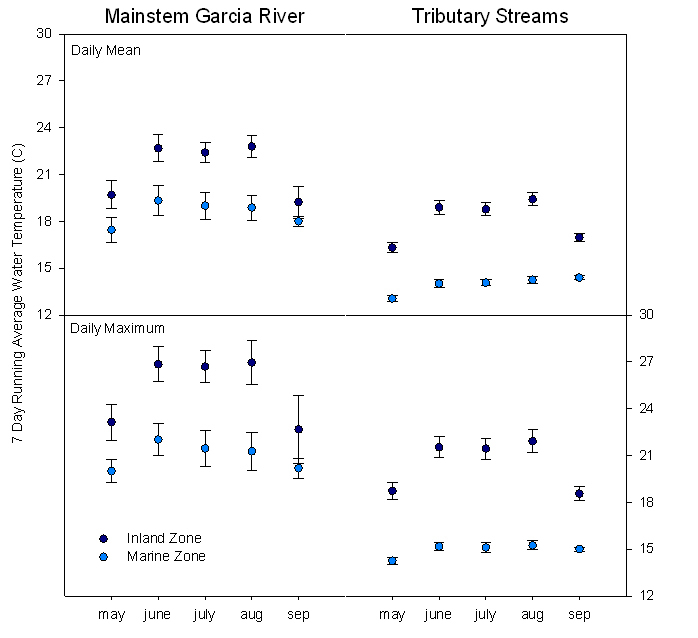 The objective of this study was to empirically determine relationships between summer stream temperature, air temperature, marine air intrusion into coastal watersheds (marine zone v. inland zone of the watershed), stream order (mainstem v. tributary streams), and tree canopy cover (% tree over-story along the 1 km reach upstream of sample location) for the Garcia River and its tributaries in southern Mendocino County, CA. 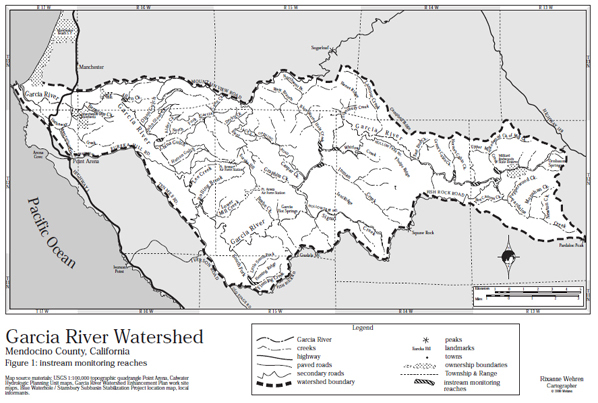 The watershed encompasses 295 square kilometers, and the headwater tributaries are approximately 64 river kilometers and 21 air kilometers inland from the river estuary near Point Arena, CA. 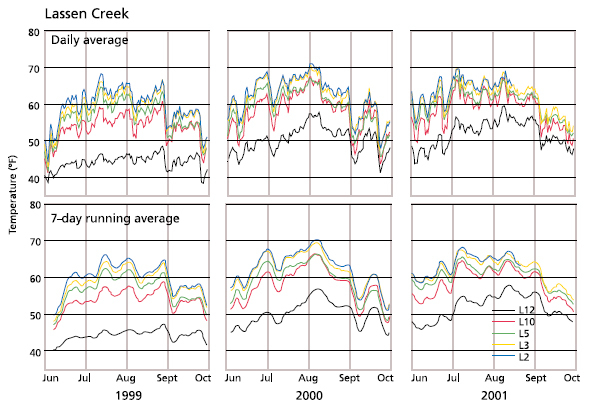 In hot, arid, inland watersheds we know that tree canopy cover interacts with watershed and stream reach scale factors such as air temperature to determine water temperatures (Tate et al. 2005 download = cal ag stats). 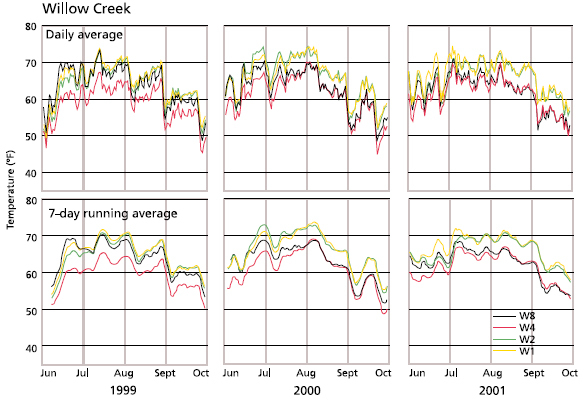 On coastal watersheds in northern California, we hypothesize that the summer time marine air mass intrusion is a major determinant of stream temperature and modifies the effect of canopy on water temperature at the watershed scale. To test this hypothesis, we monitored temperature at 6 air and 42 stream locations throughout the watershed from May through September 2000. 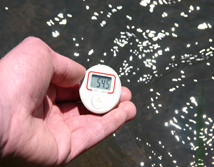 Temperature measurements were made every 30 minutes using recording data loggers. Linear mixed effects regression analysis was used to quantify relationships between water temperature (MWAT and MWMT), air temperature, marine air intrusion, stream order, and tree canopy cover over monitored stream reaches. For more information on our approach to statistical analysis see Tate et al. 2005 and Project 1 description above. Daily Maximum Temperature: The maximum of 48 temperature observations collected every 0.5 hour during the course of each 24 hour day. Daily Average Temperature: The average of 48 temperature observations collected every 0.5 hour during the course of each 24 hour day. 7-Day Running Average of Daily Maximum Temperature (weekly maximum temperature – WMT): Calculated for each day as the average of the daily maximum temperature observed for that day and the 6 consecutive prior days. 7-Day Running Average of Daily Average Temperature (weekly average temperature – WAT): Calculated for each day as the average of the daily average temperature observed for that day and the 6 consecutive prior days. Air temperature was lower in the marine influenced zone of the watershed compared to the inland zone. The maximum elevation of marine intrusion was about 600 ft above mean sea level, making roughly 30% of the watershed “marine zone” and the remainder “inland zone”. 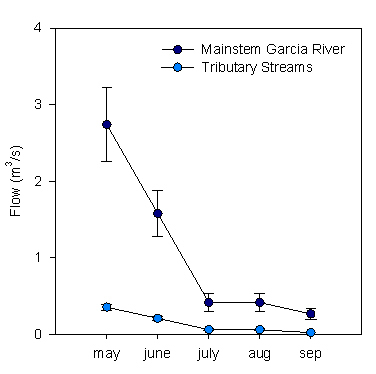 Streamflow was greater in the mainstem Garcia River than in tributaries and declined rapidly as summer progressed. 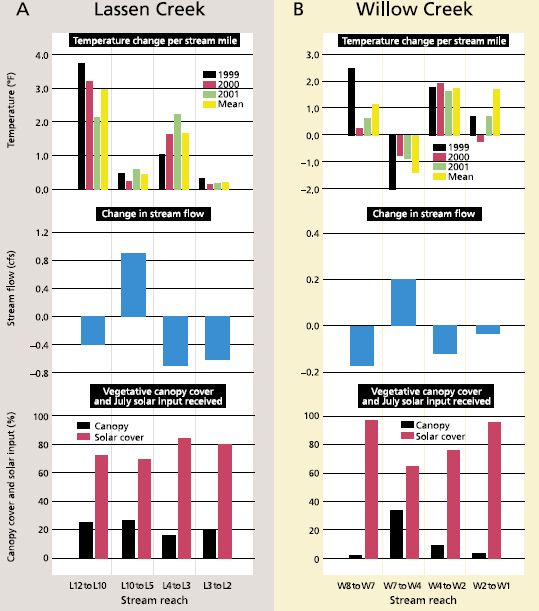 Stream temperatures were consistently warmer in the inland zone of the watershed compared to marine air influenced zone at both the tributary and mainstem scales. Tributary streams were cooler than the mainstem Garcia River, and there was greater variation in temperature between mainstem sites. There were significant relationships between water temperature, air temperature, stream order, marine intrusion zone, and stream canopy cover (P<0.05). 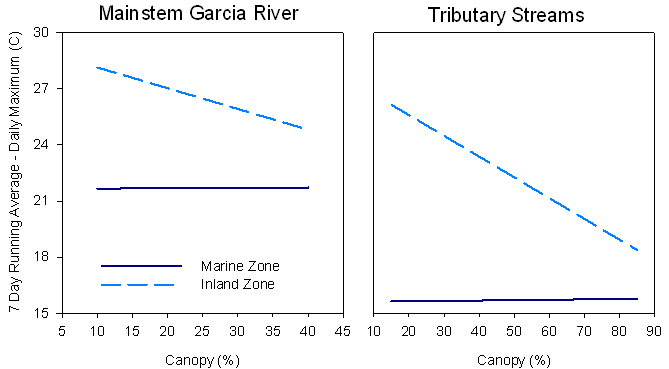 There was an interaction between marine intrusion zone (marine v. inland) and stream canopy cover. 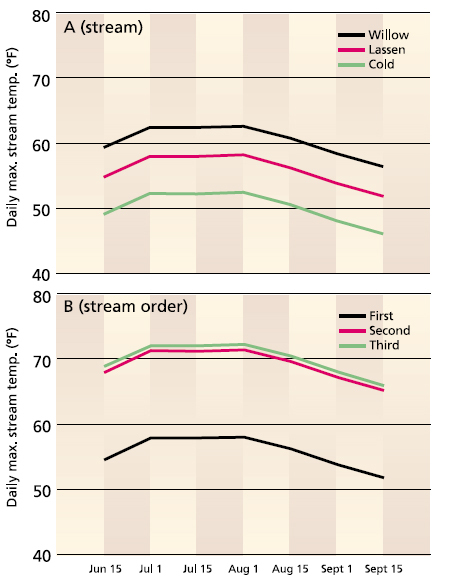 Basically, stream temperature decreased with increasing stream canopy in the inland zone – for both tributaries and the mainstem. 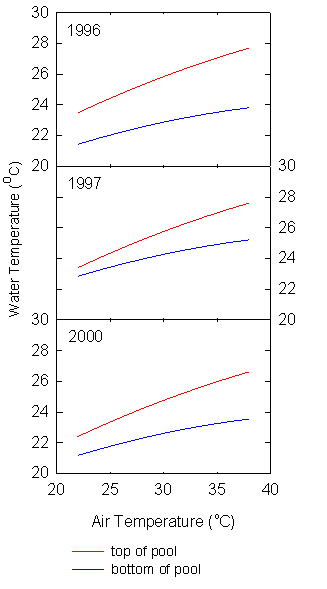 However, there was no reduction in stream temperature with increasing canopy in the marine zone. Regular overcast conditions significantly reduced solar load in this portion of the watershed. The analysis simultaneously considered air temperature and marine zone, so cooler air temperatures in the marine zone do not account for this differential response of water temperature to canopy cover.